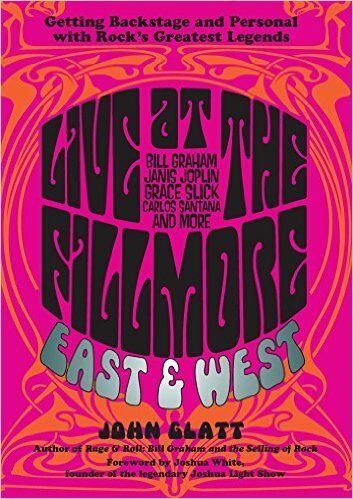 John Glatt’s wonderful new hardcover Live At The Fillmore East & West spins a tale of music, culture, characters and two wonderful concert venues-in San Fransisco and NYC-the likes of which we won’t ever see again. Learn about promoter Bill Graham, Jefferson Airplane, Janis Joplin, Carlos Santana, The Chambers Brothers and so many others, some of whom did not survive into modern times. Meet Joshua White, who provides this near 400 page book’s forward, and learn about his Joshua Light Show. Get into the mind-set (acid-addled as it was) of what exactly was happening in the mid 60’s to the beginning of the 70’s when these two concert halls thrived. Hear all the nitty gritty stories from house managers, band members, hanger-ons and fans who became icons themselves, like Patti Smith who offers some tidbits here of hanging around the village in NYC when the Fillmore East came into existence. The read here is fast and furious, Glatt provides something that you truly can’t put down, be you music fan, history buff or someone who likes a great story about a time and space nobody has since seen the likes of since. Really, what Bill Graham and his Fillmore’s managed in their short few years in existence, before the music business truly exploded-and from what Graham was warning about: mammoth shows and over-priced tickets way back in the day-should be studied. It is all surely missed by those who were there…and even those who simply read Live At The Fillmore East & West and can only wonder.